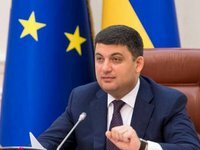 The Cabinet of Ministers of Ukraine will announce a tender to select CEO of national joint-stock company Naftogaz Ukrainy, Ukrainian Prime Minister Volodymyr Groysman said at a government meeting on Wednesday. "We today make the decision to announce a public and open tender in line with the principles of good corporate governance from March 23 to select CEO of NJSC Naftogaz Ukrainy," he said. As reported, the supervisory board of Naftogaz voted in favor of extending powers of Andriy Kobolev, the contract with whom under a decision of the government will expire on March 22. However, the board did not make the final decision without agreeing it with the government. The supervisory board sent a letter to Groysman and the Economic Development and Trade Ministry, confirming the necessity of extending the contract with Kobolev for three years. In turn, Groysman said that the government did not make any decisions on the signing of the new contract with the manager of Naftogaz.